The Master Chief really puts on a lot of miles in the Halo game series. Alien worlds (both spherical and ring shaped), massive Covenant warships, and the occasional trip back to Earth are just some of the places his missions have taken him. While he's well known for commandeering all kinds of ships and vehicles to get to the next objective, if he can't find something with wings or wheels, he'll just hoofs it. With all that marching, even the Chief, a genetically enhanced super soldier wearing a powered suit of battle armor, would need a sturdy pair of boots! Now, these licensed Master Chief Boot Covers aren't quite UNSC-issue, but they are printed and shaped to look just like the footwear a SPARTAN would sport. 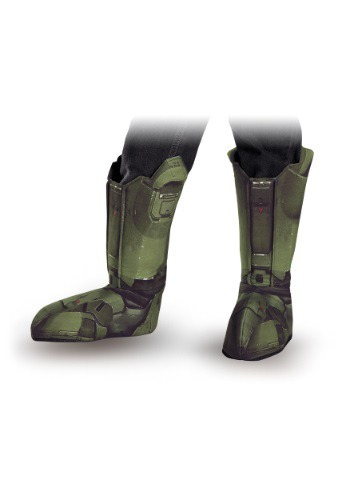 Add them to your Master Chief costume for authenticity, or just charge, guns blazing, head first into a Covenant patrol in your boots and street clothes. At least your feet will be able to take it!